Sorry, Wesley. His bouffant is bigger. This scored a 9 from us. 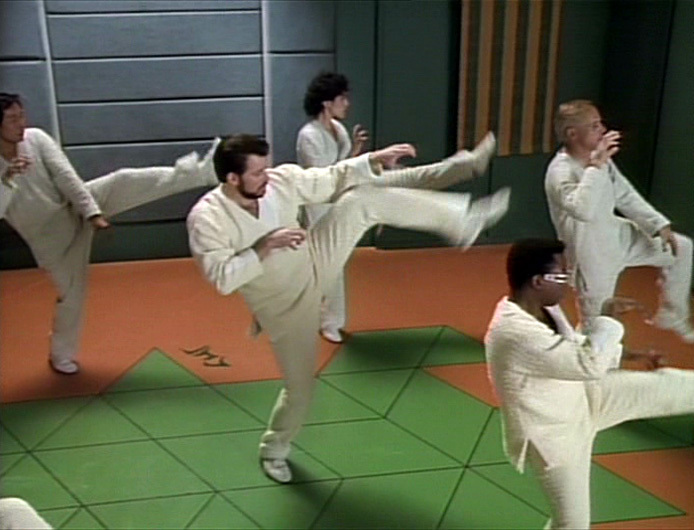 This is one of the rare looks at Starfleet Academy, and it has loads of great stuff going on. 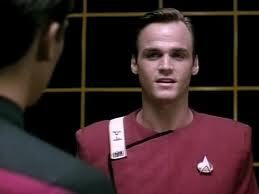 For one, Wesley gets brought down to Earth a bit, and becomes much more sympathetic as a result. But it also has a great guest cast, including Robert Duncan McNeil as Nick Locarno, and fan favorite Shannon Fill as Sito. This episode received a 10 from Kevin and me, and thus won the tie for the 18th spot on our list. It is not only hilarious, but expands the characters of Q, Guinan, and Data quite a bit. John De Lancie's performance here just might be his best on the series, and that's saying quite a bit. The bouncing ball, the fork in the hand, and the mariachi band? Come on. This is the best pure "Q episode." ...and I used to be pretty flexible. This is a fun episode, no doubt about it. Two of our raters had it relatively high on their lists, which pushed it into the top 20. I liked it more than Kevin did, and it rated a 7 from the both of us. What's really fun, I think, is the neat twist on the "Rogue Data" story, since this is caused by Picard's own order, and the individual mysteries that coalesce into the crew discovering their forgotten encounter with the Paxans. This is one of those episodes that doesn't really get old on repeat viewings. 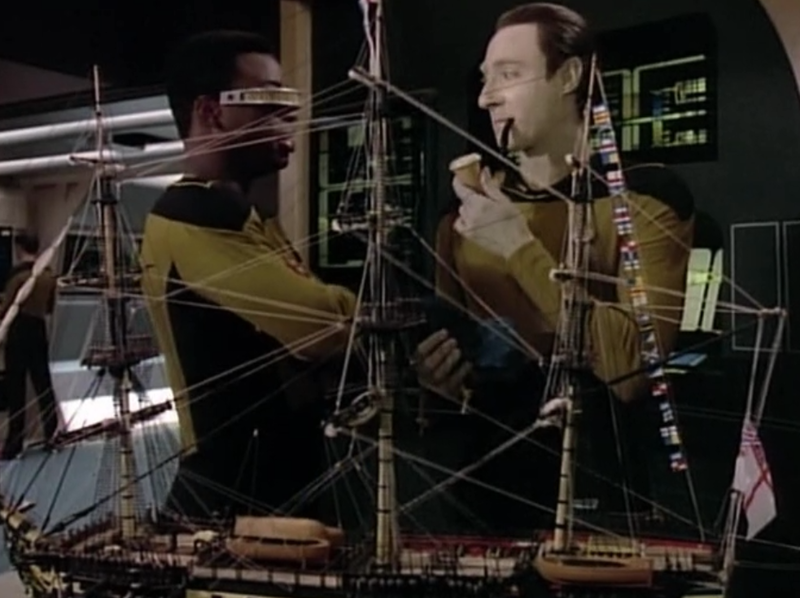 Sorry to interrupt your workday, Geordi, but we have to go to the holodeck. A Season 2 show in the Top 20? Believe it! This is a good showcase for Spiner, to be sure, but I think Daniel Davis really steals the show as Moriarty. He's so deliciously devious, while being urbane and witty at the same time. Is the method of his creation silly? Sure. But again, this one is a lot of fun, using a famous character license, good acting, and some really nice sets to spin an entertaining yarn. 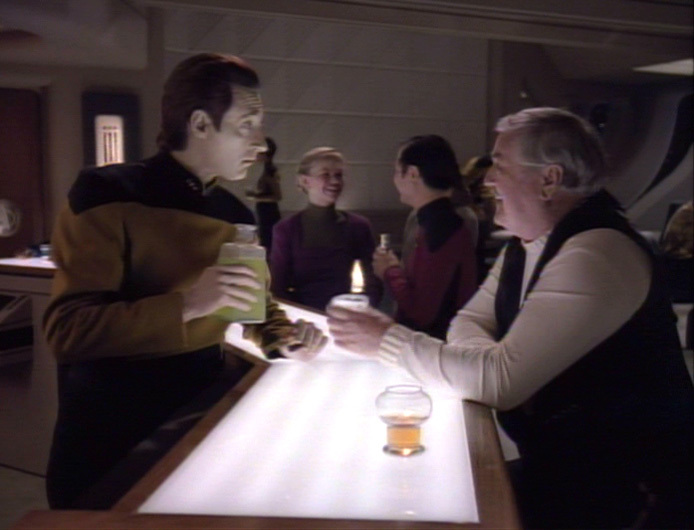 Don't worry, Riker. You'll get your chance. This is an episode that I appreciate more and more as time goes by. Blu-Ray has certainly been a boon to it, since the remastered transfer reveals just how good the effects really are. But even without high definition, there's a lot to like here. The characters are introduced deftly, getting the show off to a real running start. And come on - this show introduces John De Lancie's Q into the Trek-nerd-psyche. It's one of the greatest characters created by the show, and he is perfectly done here. 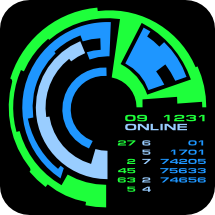 This show blew me away as a 10 year old, I lost a bit of appreciation for it over the next few years, but it's really had a renaissance in my estimation as we've done this blog. 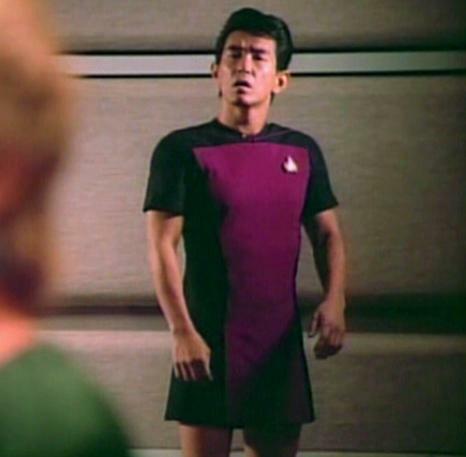 Shoulda gone for it, Geordi. She was leaving anyway. 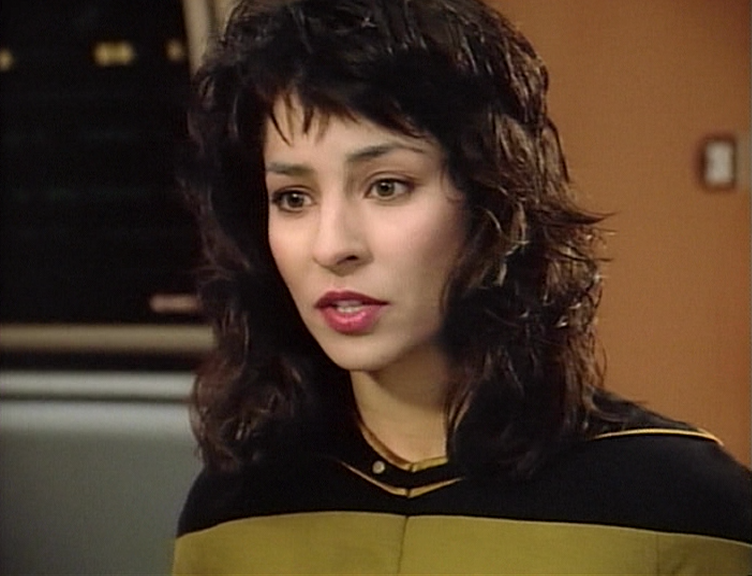 There are some who maintain that this episode is the peak of the Borg as an antagonist. I can see the argument. The good guys don't win in this show, they just get away via a Deus Ex Machina. Q is at his malevolent best here, and his friction with Guinan is great. The sense of tension and fear in this show really works. Some of its continuity was superseded by later shows. But on its own, it's really pretty darned good, and definitely worthy of a "best of" spot. By far this region's most nightmarish vision. On the other hand, there are some who think this episode is one of Season 1's cheesy lowlights. Well, those people are simply incorrect. I love this show, and it was high on both my and Kelly's lists. For me, what does it is the sheer, unbridled imagination of the story. It's a wild ride, and while I can imagine other things I might have done with it, what we get is no less entertaining. I think this is an early show that really boded well for the future of this cast of characters, and creative team. Doing the Hokey Pokey this many times in a row is sheer torture! 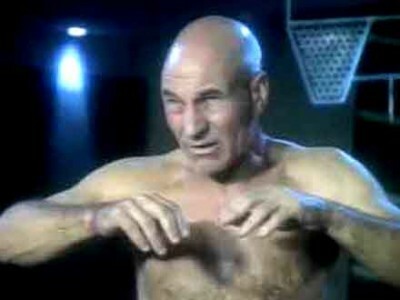 Patrick Stewart vs. David Warner. You'd have to get this pretty wrong to make it bad. Well, they didn't get it wrong. 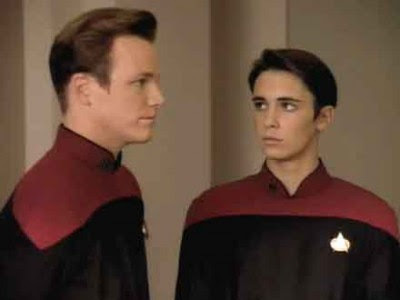 Picard's intellectual and emotional showdown with Gul Madred is one of the highlights of the series. It is perfectly acted, gives us a great catchphrase, but also deepens the Cardassians in a way that they hadn't been to this point. It's kind of a harrowing view, not as "fun" as some on this list. But it sure is a great story. Who's your daddy? No, seriously. Kevin and I gave this a 10, and it's easy to see why. Not only does it feature some of Patrick Stewart's best work on the show, but it also gives us a long-desired view of Earth culture, fills out backstories for Picard, Wesley, and Worf, and is jam packed with emotionally affecting scenes. It's the perfect coda to the Borg cliffhanger, and is certainly better than the second part of that story. 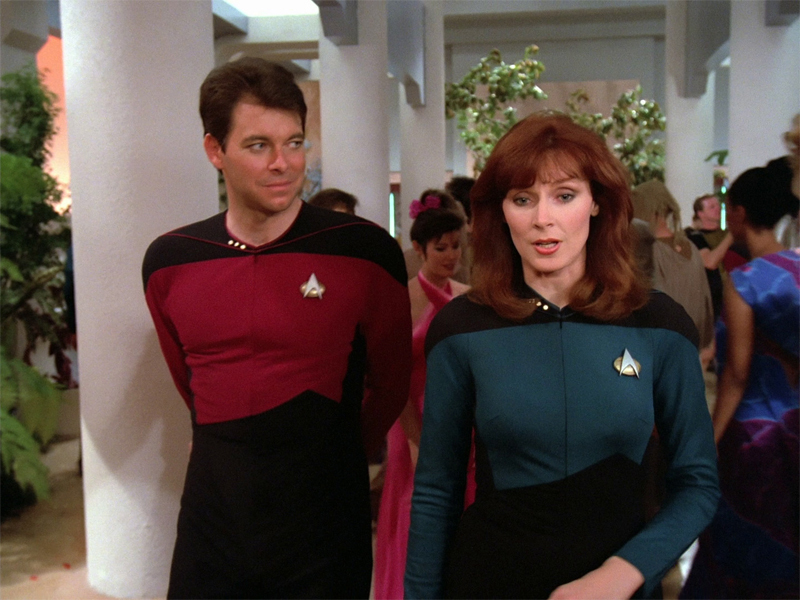 OK, that's the first half of our list of the 20 best TNG shows. Tune in next time for our top ten episodes! Are we going to get see the eventually voting(Like they do for MVP and Cy Young Voting. I forgot about Relics. Where I would have placed it would not have moved it much, but still. I treated this more as a strict "Best of" as opposed to favorites, so I limited my options to what I gave 5s a few high 4s to flesh out. Relics should have still made my list though. I'll rectify it when we get around to publishing personal favorite lists. I left Relics off my list as well. It was one of 4 or 5 "on the bubble" episodes that was vying for the 20th spot. But that's the beauty of the group list - our lady listmakers apparently both felt it was worthy of inclusion, and they were probably right.